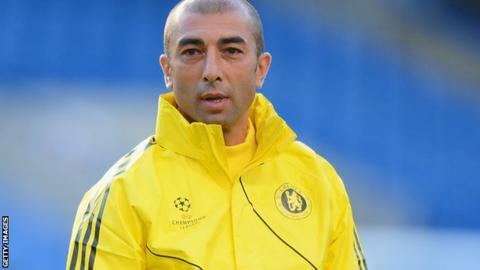 Roberto Di Matteo has confirmed that Roman Abramovich visited the club's Cobham training ground following the Champions League draw with Juventus. But the Chelsea manager insists it is nothing new following reports that the club's owner had spoken to players and coaching staff on Thursday. "He comes quite often to be honest. He likes to be involved and comes down whenever he can," said Di Matteo. "He is the owner and likes to know what is going on and speak to people." Di Matteo added: "We weren't happy about the result we got so it wasn't a perfectly happy camp, but will we have to pick ourselves up and win in the Premier League." The Chelsea manager accepts he is under pressure to produce positive results and stylish performances from his team. "At a big club you are always under pressure and have to win games and in the right manner as well," he said. "That is part of being a big club and nothing different with us." Brazilian midfielder Oscar, who scored twice in his first start for Chelsea against Juventus, is expected to be fit for Saturday's game against Stoke after sustaining an ankle injury. "It was a spectacular debut and we hope to see more of him," said Di Matteo. "We saw a little bit of that in training so it was great to see that quality in a big game like that. We are very pleased we have him." Di Matteo is also wary of the potential threat from Michael Owen, who made a brief appearance off the bench for Stoke in their draw with Manchester City last Saturday. "He is a very good signing. I was a little bit surprised because he is not a tall player like all the others, but certainly a dangerous player and I am sure they will benefit from his qualities."